In the shadows of a windowless room, 17-year-old Nancy Majola sits between the television and a space heater. The heater’s few functioning coils glow a promising orange in an affront to their minimal effect. Like most homes in Alexandra Township, this battered, concrete structure has no heat, its interior colder than the brisk air outside. Despite the chill, Nancy dons mesh soccer shorts that form part of her year-round attire. She peers out from under a Bafana Bafana cap to watch Japanese players challenge Cameroon in a World Cup match underway a few miles from here, in central Johannesburg. As she studies the moves of the world’s greatest players, her frigid surroundings are evidently far from mind. 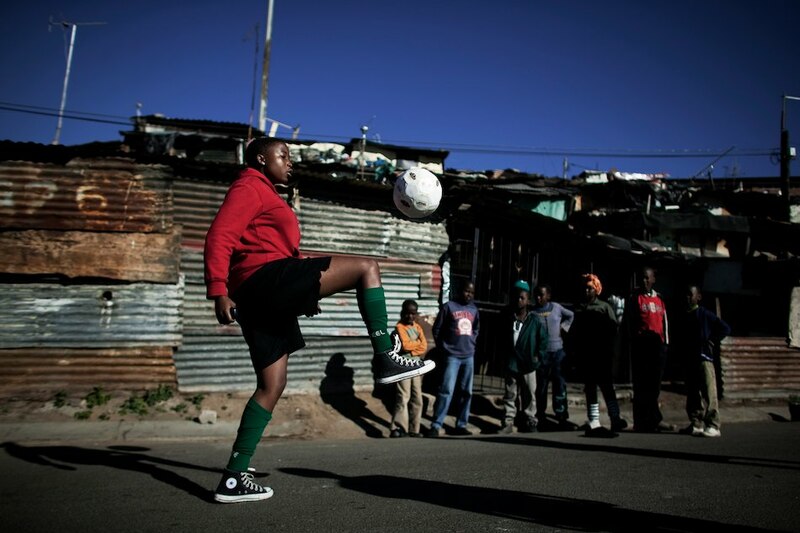 Enroute to a local field, Nancy and two friends kick a soccer ball between tin shacks that now define this overcrowded township. Loitering men with questionable intentions break from dice games to watch them pass. Despite evident discomfort, the girls remain focused on the ball, cracking jokes and moving at a clip. “I am not afraid in Alex,” Nancy says in a defiant tone. “I am used to it.” The men leering in her direction are likely among the 75 percent of unemployed people here. Such staggering rates contribute to the prevalence of crime and substance abuse. “A lot of people are being hurt by the street life, from drugs and alcohol,” Nancy remarks. – Written by Pete Muller. This piece appeared initially in The New York Times. This entry was posted on Wednesday, June 23rd, 2010 at 10:46 pm. It is filed under Characters, Nancy and tagged with maradona, nancy majola. You can follow any responses to this entry through the RSS 2.0 feed.